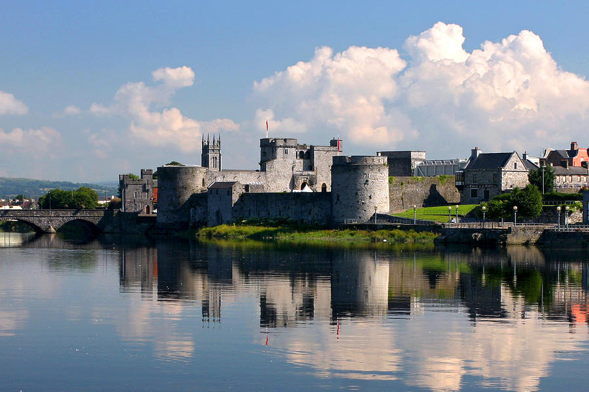 Limerick is located in the Mid-West Region and is also part of the province of Munster. The city lies on the River Shannon which at 222 miles long is the longest river in the British Isles, with the historic core of the city located on King’s Island. Luimneach (Gaelic) originally referred to the general area along the banks of the Shannon Estuary . The earliest settlement in the city, Inis Sibhtonn, was the original name for King’s Island during the pre-Viking and Viking eras. There are 102,161 people living in the Limerick City Metropolitan District. The city dates from 812 which is the earliest probable settlement; Greek map-maker, Ptolemy, produced in 150 the earliest map of Ireland, showing a place called “Regia” at the same site as King’s Island. History also records an important battle involving Cormac mac Airt in 221. The Normans redesigned the city in the 12th century and added much of the most notable architecture, such as King John’s Castle and St Mary’s Cathedral.